The hangar was dedicated this month by Sir Richard Branson, whose Virgin Galactic is the anchor tenant of Spaceport America. Virgin Galactic plans to launch a fleet of suborbital space planes called SpaceShipTwo from here. SPACE.com reporter Clara Moskowitz visited Spaceport America near Truth or Consequences, N.M., a site that's billed as the world's first purpose-built commercial spaceport. Here's what she saw during her October 2011 visit. After two hours of driving through the desert, a structure appears to rise from the sand. It's soft and rounded, and almost the same color as the beige terrain around it. Yet as our tour bus drives closer, light glints off metal. What resembled a mushroom in shape and color from the distance starts to take form as a futuristic building. A hangar, in fact. 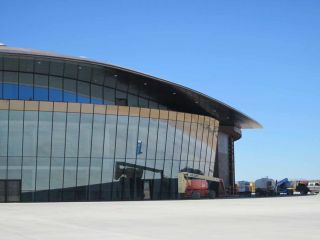 In October 2011 SPACE.com reporter Clara Moskowitz toured Spaceport America, a new commercial space launching ground under construction in the Southern New Mexico desert. The facility, which will cost $209 million when all is said and done, is financed entirely by the state of New Mexico. Its taxpayers are betting that if we build it, they will come. "They" refers to the nascent private space industry — firms that plan to launch paying tourists to space. Spaceport America already has its first big anchor tenant: British billionaire Sir Richard Branson's Virgin Galactic. Virgin Galactic has pledged to fly its SpaceShipTwo suborbital craft, which can carry six paying astronauts per flight, from the New Mexico spaceport. Branson himself was here recently to dedicate the main hangar, newly christened the "Gateway to Space." When we arrive, I step off the bus onto an island of pavement in an ocean of sand. It's clear that the terminal hangar and a nearby dome-shape office building, the Spaceport Operations Center, have been designed with style in mind as much as substance. Their curving shell-like roofs resemble flying saucers — a nod, perhaps, to the city of Roswell, N.M., about four hours away. "This is part of the experience Virgin is selling," Chad Rabon, the spaceport's operations manager, told me. "The roof more or less looks like it's floating. It's very unique." The spaceport team plans to complete construction on the main terminal next year. The 114,000 square-foot facility can house up to six SpaceShipTwo vehicles, and two of its WhiteKnightTwo motherships, which will carry the spaceships to midair before they ignite their rocket engines to climb to space. Across from the hangar is a giant "spaceway," a specially built runway that's 2 miles long (3.2 km) and 200 feet wide (61 meters). The cement stretches out into the distance, cutting a swath of order in the wilderness of crumbling baked-dry dirt and scrawny weeds. "This is really a whole city that we built out here in the middle of nowhere," said the spaceport's executive director, Christine Anderson. Everything has had to be built from scratch — not only the buildings, but also the power lines, water tanks and even a paved road out to the facility. The location is part of its charm. Though inconvenient to get to, by the time I arrive, I feel I've already come on a journey. The nearest town is the 7,000-person Truth or Consequences, a spa town that changed its name from "Hot Springs" in 1950 to win a radio show contest. Between "T or C," as the locals call it, and the spaceport, the only living creatures to be seen are grazing cattle and bison. Spaceport America's isolated location is just one factor in its favor as a space travel hub. It's located right next to the White Sands Missile Range, whose restricted airspace prevents any interference from passing aircraft traffic. The weather is consistently clear and unchanging, and its elevation of 4,200 feet (1,300 meters) means that it's that much easier and cheaper to get to space compared to launching from sea level. The spaceport is almost ready. Now it just needs more customers to use it. Besides Virgin Galactic, some smaller suborbital rocket firms, such as UP Aerospace and Armadillo Aerospace, have also come onboard. But eventually Spaceport America planners foresee more big-ticket tenants, and maybe even orbital launches taking place. They're also planning an intensive tourist experience, complete with a state-of-the-art visitor's center and simulation rides, to attract day visitors. From my perspective, it should be worth checking out.